Seal coating is an important tool in extending the life of pavement and should not be overlooked. As asphalt ages, it will begin the process of deteriorating due to exposure to oxygen. 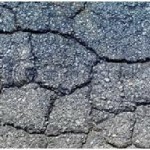 As this continues, the asphalt begins to oxidized, resulting in the asphalt losing its color and the surface becoming more brittle, producing cracks. In the later stages of degradation, a condition known as raveling begins to occur. Raveling is a condition most notable when the pavement takes on an extremely rough and porous texture appearance. The increased porosity traps dirt and moisture and makes the surface harder to clean and take longer to dry. Also because the asphalt is oxidizing under the UV radiation, it loses its flexibility. This flexibility is extremely important because asphalt can take great loads and bounce back to its original condition. As asphalt loses its flexibility it becomes brittle and begins to crack and break. In the winter, a seal coated surface is much easier to remove snow from, due to the fact that the seal coating fills chips and splits. This smooths the asphalt surface and allows a shovel to slide quickly and easily across it. In the summer, the dark black color of a seal coated parking lot will absorb a large amount of heat. This, in turn, makes the surface more pliable. Because of this pliability the surface of the parking lot is able to withstand the heavy amounts of traffic that run across it. The smooth surface provided by seal coating also makes it much easier when it comes time to do parking lot striping. Not only does the paint go on smoothly, it also takes fewer coats and the highly reflective paints used to stripe parking lots shows up much better against the beautiful, deep black of a freshly sealed surface. 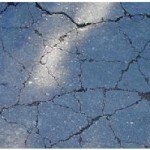 Another great weapon in the arsenal of the pavement maintenance contractor is crack sealing. It is important to seal cracks especially in climates that are subjected to freeze / thaw cycles with a quality product made especially for crack sealing BEFORE seal coating. Even after seal coating, unsealed cracks will allow water in that can cause damage to pavement if permitted to get down into the pores of blacktop or worse into the base under the asphalt causing “frost heaving” requiring expensive repairs. Let them get away from you and they will cause more and more damage to the point that finally your parking lot cannot be repaired; it must be replaced. Stay ahead of them and you can help to extend the life of your driveway or parking lot. 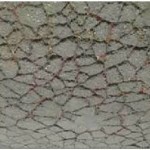 Proper crack sealing will last the life of the seal coating and the cracks won’t “come back”. By seal coating and crack sealing, the life of the asphalt can at least be doubled and many times by as much as 300%. So leave it to the professionals at Lawn Care Company. Contact us today for a FREE consultation and estimate on your seal coating needs! Your asphalt driveway or asphalt parking lot represents a substantial financial investment. We can help you extend the life of your asphalt driveway or parking lot with our seal coating services.